The World Trade Organization recently revised downward its 2016 estimate for growth in world trade to 1.7 percent . This new figure represents a 40 percent drop from its April forecast, and the slowest rate since 2007. It is also lowering its growth forecast for 2017. Stock markets are predicted to decline as well due to concern over this slowdown in the growth of international trade. This darker outlook is largely due to a rise in anti-trade sentiment, not only in the United States but in Europe as well. A few days ago the parliament of the Belgian region of Wallonia — most of us did not know that there was one — rejected the EU’s plan to go ahead with a trade agreement with Canada . There is a German court challenge pending to Brussels’ competence for this deal as well. This trade agreement between the EU, with a population of 510 million, and Canada, with only 36 million inhabitants and high average wages, was hardly a threat to European workers. But political obstacles interfere with even this relatively small agreement becoming a reality. 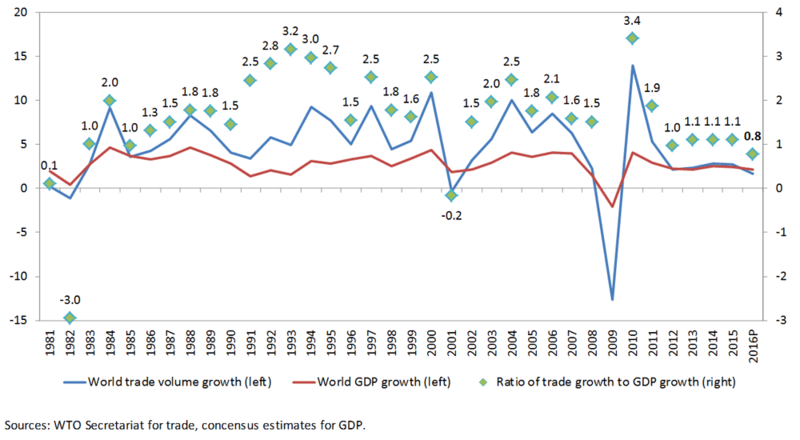 Should business care about this apparently minor setback for global trade? The answer is, unfortunately, yes. Approval of the Canada agreement would help to pave the way for the much bigger agreement with the United States — the Transatlantic Trade and Investment Partnership (TTIP) — a major Obama Administration initiative. If there is no movement on the Canada agreement, the chance for Europe moving forward with a deal with the US is that much less secure . In the US, for the first time in memory, trade has become a high-profile topic in a presidential election, with both candidates pledging to reject the Trans-Pacific Partnership (TPP). This agreement, signed by the US and 11 other Pacific Rim countries just over a year ago, needs Congressional approval. While the President has been pressing to get Congress to act by year’s end, Republican leaders in both Houses of Congress have deemed ratification extremely unlikely in the few post-election days in this Congressional session . Regardless of who wins the US election on 8 November, the next President is unlikely to be in any position to lead international trade negotiations, even if he or she wanted to do so — at least not for a few years. No TPP signatory country is going to be willing to renegotiate the agreement to meet the new US administration’s political needs without making demands of its own — for example that there should be more American imports of sugar from Australia . Failure to put the TPP in effect is not the full extent of the damage to US leadership. No other country will likely consider negotiating a bilateral deal with the US knowing that Congressional approval would be very difficult to achieve in light of the TPP experience. This does not mean that other countries will not continue to negotiate trade agreements with each other. There are plenty of negotiations contemplated and underway, the largest of which is led by China . These deals share one common feature: they include neither the United States nor in most cases Europe (nor Africa nor Latin America for that matter). These agreements would not be as strong substantively as either of the US-led TPP or TTIP deals, which extend so far as to include provisions on ensuring the free flow of digital commerce across borders. Importantly, they would not benefit workers or companies headquartered in non-participant countries and, worse still, they would provide for discrimination against the rest of the world’s goods and perhaps some services.